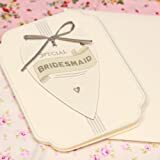 Thank your bridesmaid with this beautiful card from East of India with a tag on the front with the words Special Bridesmaid and a thin ribbon bow. Inside is left blank for your own words. The card comes complete with an envelope. The card measures approx 10.9cm wide and 15.3cm high. This entry was posted in Wedding Store and tagged Bridesmaid, Card, East, heart, India, Special, Wedding by Formal Affair. Bookmark the permalink.